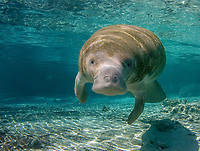 The Florida manatee, Trichechus manatus latirostris, is a subspecies of the West Indian manatee. 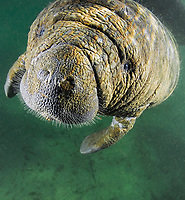 It frequents the coastal waters of Florida, particularly in winter, but its range extends as far north as Dennis, Massachusetts, and as far west as Texas. 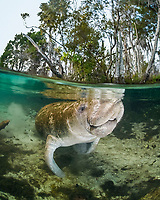 They have been protected by many laws in Florida, but in modern times, they face the extreme danger of collisions with motorboats, and many manatees in and around Florida can be identified by the propeller scars on their backs and severely injured tails.